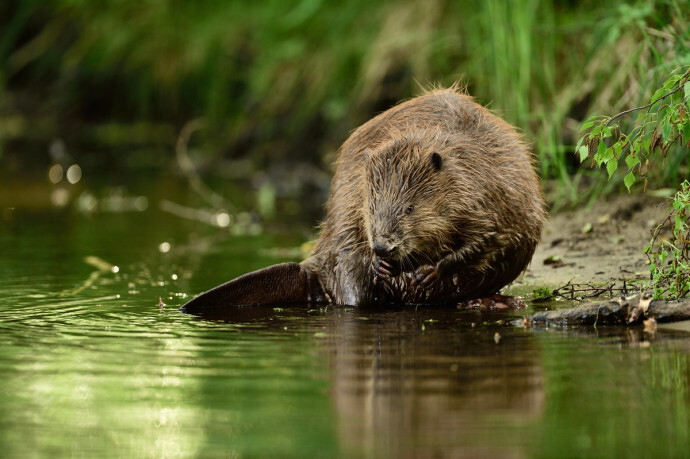 Danube Delta rewilding area, a biosphere reserve and UNESCO heritage site from 1992, is presented in this blog through the eyes of volunteers monitoring the beavers from Parcheș village. 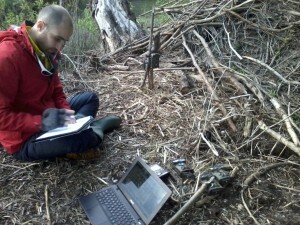 Beaver monitoring is a part of the initiative here set up by Rewilding Europe, together with WWF Romania. The light falls in a certain way. The channels have their special tranquility. The fog, no matter how persistent, is not obstructing the view over the horizon. These are just some of the elements that describe the Danube Delta rewilding area. The beavers (Castor fiber, locally called “breb”) who came back after hundreds of years are very determined to build and change the micro relief and to modify the ecosystem they live in. “I love the route by boat to the beavers’ lodge because I’m passing through the poplars and willows gallery-forest. For me it is enchanting. I have the opportunity to see so many plants and birds and I feel more connected to nature than ever”, Gabriela Tamaș explained. Gabi applied without any hesitation for the internship programme, which was set up to monitor the beavers, seen for the first time in Parcheș in 2011. The main reason was the location given that the Danube Delta rewilding area is her favorite place, a place that preserved its authenticity in spite of all the anthropic pressures. “I am restless each time before I go and check what the beaver family build since the last time I was there, in what state the lodge is and if we have any after dark camera trap recordings. I leave that place full of energy, joy and eager to go back as soon as possible”, Gabi added. There is a very small beaver population living near the Parches village. They choose to come to the Delta instead of staying in more welcoming places. It seems that the beaver allows the camera traps, this ‘big brother’, to watch and record its every movement. Together with all the animals visiting the lodge which beavers work so hard to maintain, patch and consolidate, the beaver is indeed under a magnifying glass. If the world learns about the beaver and his family, they would definitely know also more about wild boars, wildcat and about so many other mammals and birds coming to the lodge as if they look for shelter at an inn after a long journey. ’’The wonderful team of volunteers which are monitoring the beavers are showing us something very important – that each of us can truly make a difference and that all of us can pay attention to what is going on around us’’, says Alexandra Panait, Team Leader of Danube Delta rewilding area. ‘’They have shown us that we could be directly involved in conserving a strictly protected species in Romania and that nature conservation should be a civic duty that comes from passion and responsibility. All the information the volunteers collected since October 2014 will be used to prepare and issue a report that will make recommendations for the species conservation to the Reserve Administration”, she continues. ’’The peace of the channels, the mist, the serene early morning light, the birds’ bustle and all the other animals attracted to the beavers’ lodge away from the world’s hustle lure us there, and above all – inspire us’’. You can stay updated about news in Danube Delta and follow the activities at Rewilding Danube Delta Facebook page. The volunteers who are making the monitoring possible are Marius Bujor, Letiția Popovici, Tudor Racoviceanu, Diana Ion, Latif Stoica, Irina Turcu, Sorin Ion and Gabriela Tamaș.